Most agricultural chemicals are applied with sprayers. Sprayers are used with liquid solutions or suspensions. Sprayers should be constructed of materials that can tolerate the type of product used; some products may be more abrasive than others may. - Electronic Systems; with the advancements in technology today, new systems have been established to improve application. 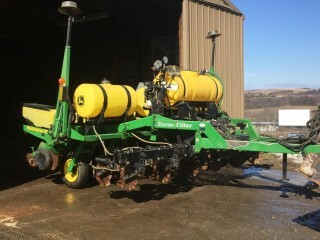 These systems are capable of monitoring and guiding the sprayers in a variety of ways; some sense the location in the field, travel speed, and the total flow of spray to the boom; some systems tell the nozzle flow, the area covered, the total volume sprayed, and the amount left in the tank. - Hoses; choose from neoprene, rubber or plastic hoses; ensure they have these qualities – have a burst strength greater than the highest operating pressure, have a working pressure at least equal to the highest operating pressure, resist harsh or corrosive effects of oil, solvents and pesticide product and formulations used, and are weather resistant. - Pressure Regulator; protects sprayers from damage due to excess pressure. - Pump; most frequently used are roller, piston and centrifugal pumps. When selecting a pump, be sure to be thinking about the pressure ranges the pump can handle and the gallons per minute the pump can source. A faintly oversized pump will guarantee the relief valve will operate and get the job done. - Tanks; should be constructed of stainless steel or fiberglass. Should the tank be made of mild steel, it will need a protective lining or coating. The tank should have a large opening for easy filling and cleaning, as well as a large drain and a gauge to show liquid level. - Check the pesticide label for any detailed cleaning instructions. - Drain all pesticide solution from the sprayer. Save & reuse. - Flush the sprayer with clean water. - Fill the sprayer with water plus one cup of trisodium phosphate or household ammonia for each 10 gallons of water. 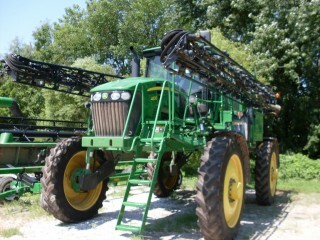 - Wash the tank and pump parts by running the sprayer for about five minutes with the nozzles closed. - Is possible, let the cleaning mixture soak in the sprayer overnight. - Release the mixture from the tank, freeing some through the nozzles. - Always flush a new sprayer with clean water before you use it. If your sprayer won’t be used for a while, cover the exposed metal parts with light oil to avert rust.